I’m a pentegenarian polymath with a penchant for poking around in things. I look down side-streets and say “I wonder where that leads to?” I’m a single parent to a teenage boy. My preferred modes of transport are cycling and walking. I love the human race, even though it is the most annoying species on the planet (well, except maybe fleas and mosquitoes). I’ve known how to solder since I was a teenager and I’ve been tinkering occasionally ever since, but Restart converted an occasional pastime into a passion. 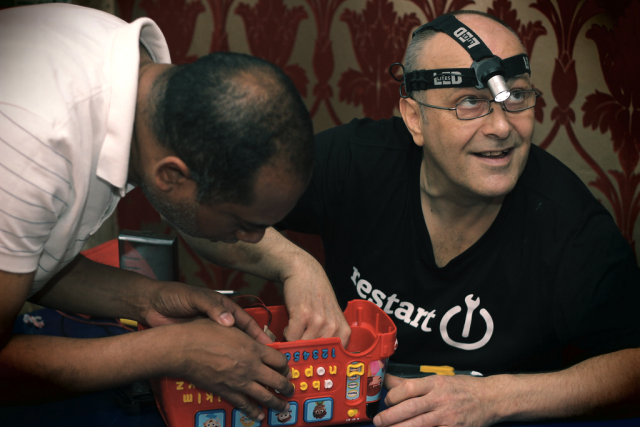 They’re interesting, fun, sociable and we get to shrink the e-waste mountain while meeting new and interesting people. Also, there’s usually good snacks and a cup of tea on offer. I’m an IT guy (Linux, servers, that kind of stuff). I volunteer with other green organisations such as Sustainable Hackney and Hackney Cyclists. I’m a parent. My own limitations. There are too few hours in a day. That some people just don’t understand that all things are finite and that we all share the Earth. A need to wake my teenager for school (while my inner teenager tries to keep me in bed). A desire to make a difference, no matter how small. Pink fluorescent duct tape. Or, if you’re being serious: nothing, it’s people that make my world what it is, everything else can be replaced. http://www.therestartproject.org of course! If you want something else, here are some lampshades I made out of repurposed CDs.